Samsung produces a range of stylish, powerful and affordable ultraportable laptops. Its Q70 (£699 inc. VAT) personifies this with its combination of impressive specifications, strong usability and excellent battery life. The 2kg chassis is ideal for long-term travel. It isn't as slim as we'd like, but is compact enough to carry in small luggage. The 314-minute battery life easily kept us working during the day, but the large battery protrudes 20mm from the rear of the chassis. Build quality is generally excellent. The glossy lid is easily tarnished, however, so it's essential to carry the Q70 in a suitable case when travelling. The keyboard is one of the best we've used, and its large keys and smooth action make typing comfortable and accurate. The 13.3-inch screen is bright and sharp. Colour and contrast are both slightly flat, however, which can leave photos and videos looking washed out. 3D performance via the integrated Intel graphics chip is also low, but has enough power for photo editing and basic gaming. General performance is far more impressive. A Core 2 Duo processor from Intel's latest range has been used and you can easily multi-task and run high-powered applications without any noticeable drop in speed. Despite the high performance within such a small chassis, the Q70 stays cool at all times, and the cooling fan is never distracting, so you can work in peace. The brushed aluminium used around the keyboard also feels cool to the touch. Storage is impressive for such a small laptop. The 250GB hard drive will easily hold an entire family's files. The dual-layer DVD rewriter also lets you back up data to CD and DVD, and includes LightScribe technology for burning your own labels to compatible discs. Connectivity is something of a mixed bag. 802.11n Wi-Fi lets you connect to wireless networks at the fastest possible speeds. For connecting to external displays, however, only an analogue VGA output is provided. Software is another area worth bearing in mind. 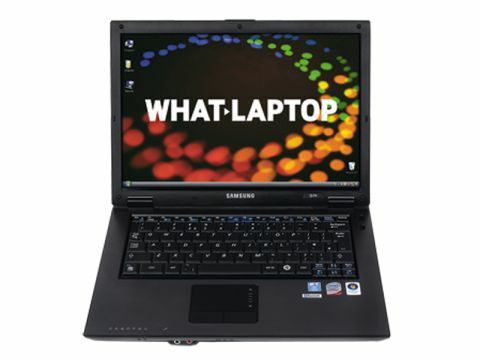 A range of DVD playback and creation tools is included, as well as proprietary system maintenance applications from Samsung. There is no office software included, however, so you'll need to factor this into your budget. For its sheer power and mobility, the Samsung Q70 is a great ultraportable for the regular traveller. The affordable price tag adds to the value and makes it all the more appealing. The limited connectivity and software disappoint, but the Q70 still comes highly recommended.